← 4 Marblehead Wins in a row for Tommy..
RUS 27 Throws down a Challenge…..
Anatoloy Loginov helming his RUS 27 to victory in day 1 of Douarnenez. 77 Boats have registered to compete for the Gazprom International Dragon Gold Cup here in the beautiful bay of Douarnenez. With entries from so many different nations, it’s hard to pick a winner. However, one team that have certainly made their intentions clear is RUS 27 helmed by Anatoly Loginov and crewed by Vadim Statsenko Alexandre Shalagin, who had a convincing win yesterday in difficult shifting conditions. The PRO had to wait for steady winds as the oscillations were moving the wind from 270 degrees to as much as 315 at times and with the wind forecast to go right later in the day, it was not an easy day to predict your tactics. However, after several General Recalls and unfortunately one on a Black Flag that saw 10 boats DSQ, the race eventually started late in the afternoon. At the start the line was biased at the PIN, as the oscillation was in a “left” phase, this allowed for some boats to tack onto port and cross the fleet. But ONLY if you were able to tack! 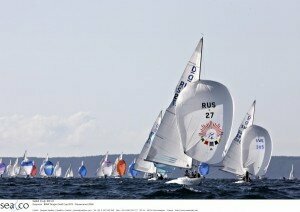 as TIM TAVINOR explained to me “We (GBR 785 Lawrie Smith) were alongside RUS 27 on the start, but could not tack. We saw Anatoloy tack and wanted to go with him, but we just could not cross one boat, then our chance was gone”. When I spoke with Anatoly’s tactician, Vadim said ” We were able to tack immediately as no one was beside us, then we continued across to the right ahead of everyone. Luckily we got across the fleet before the right hand shift came, then we could tack and make another gain”. So you see my friends, it’s the small differences that matter…..
RUS 27 led at the top mark and then continued to increase his lead over the very long 2.5 mile beats , in 2nd place was RUS 76 Dmitry Samhokin and 3rd FRA 386 Luc Pillot. There were 4 more boats ruled out with the Black Flag, so a total of 14 boat’s now carry a DSQ in this 6 race non discard series. Today’s race again starts at 3pm, so more fun on the water for this extremely competitive fleet at this well organised event. The bay of Douarnenez is always a most exciting place to sail as each day the challenge is different, the competition is excellent and the après sail entertainment is first class…. Higher, Faster, Longer……… Stavros (GBR 767).